Sometimes running isn’t the easiest thing to find self-motivation for, especially in the cold winter months ahead. Let’s face it, it’s cold, painful, harder to breathe and annoying trying to decide if you’re going to overheat or freeze depending on what you decide to wear. Luckily with the Brooks PureFlow 2, deciding on the right neutral shoe to wear is no problem. 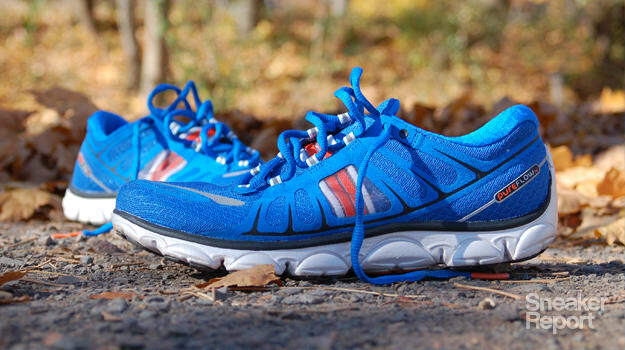 These Brooks are so comfortable and rejuvenating on foot that you’ll never have another excuse to miss a run. Once the shoes are on, your senses start to pick up certain qualities instantly. For example, the high arch supports, and the wide sole which sits wider than the shoe itself, giving your foot a really nice foundation. These runners hug your foot nicely without even being tied. This is because of a nifty feature known as the “Nav band”. Brooks made the right decision when they chose to bring it back from the PureFlow 2 predecessor, the PureFlow. The Nav band works like an elastic lace that keeps your foot in place as well as supporting your arch. Similar to the Brooks T7 Racer, the PureFlow 2 also features a mesh arch saddle. For those wondering what an arch saddle is, it works like this - as you pull your laces tight, the mesh upper lifts and yanks upward on your arch, allowing for more support. So if you’re someone with low arches but really want to give neutral running a try, these will be a good option. "...You’ll never have another excuse to miss a run." One thing about the Brooks PureFlow 2 is that they transition beautifully between different terrains like pavements and trails. They had enough support to keep you comfortable on the road, and were thick enough to take on any of the bigger rocks found on the trails. Aside from the comfort, these runners have lot of grip and spring in their step. When it came to any slick patches, like near leaves or random puddles be careful. The traction began to give a little but on dry pavement there’s no problem. Speaking of the sole, they are lined with thin black rubber that has the tendency to wear somewhat quickly, however there are reviews out there of guys putting up to almost a thousand miles on them before their new pair. One thing that I thought was pretty cool and innovative was the split-toe design. Brooks has separated the big toe from the rest of the toes in order to give them free range and help with better balance. This really became noticeable when attacking hill. Next time you dig your way up the hill, take note of how you curl your toes for traction. With the PureFlow 2 you can feel your big toe acting independently from the rest, helping get the job done with a more natural feel. The next thing that needs to be addressed is the “Ideal Heel.” There’s a lot going on back in the heel. First off, the “Biomogo” sole (which means it’s a biodegradable sole) wraps all the way up to the back of the shoe helping promote a forefoot strike. By eliminating some of the heel and adding the 4mm insole drop, your foot naturally wants to be up on the forefoot and toes. Then, with the removable footbead, the heel sits down in a deep cup. This is then supported by an almost plastic type material built into the upper. The back of the shoe, from the heel up to the Achilles is rock solid. Bottom Line: If you’re looking for a lightweight minimalist trainer, be sure not to overlook the Brooks PureFlow 2. This shoe is Lightweight, has great support, and a unique, innovative way to promote forefoot strike, leading down the path of successful neutral running.